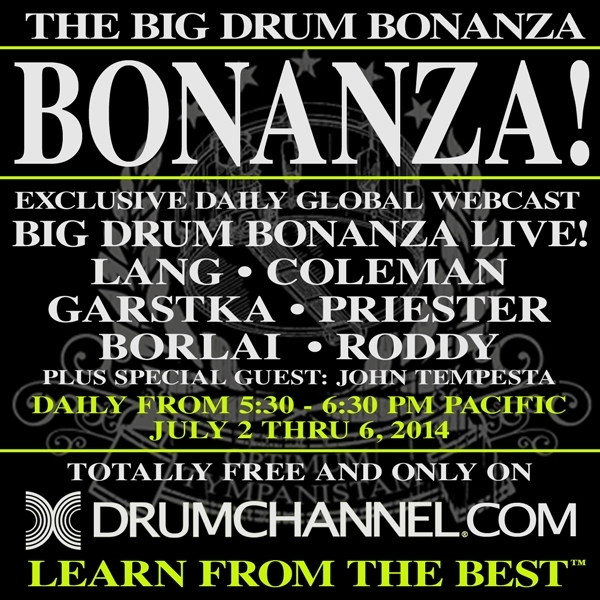 Oxnard, CA – Six of the world’s top drummers will be featured on DrumChannel.com’s live, daily webcasts of Thomas Lang’s “Big Drum Bonanza” drum camp from July 2-6 at 5:30 PM (Pacific Time). The free, hour-long shows— which can be accessed from computers and mobile devices virtually anywhere on the planet— will include appearances by Thomas Lang (stOrk), Chris Coleman (Prince), Matt Garstka (Animals As Leaders), Aquiles Priester (Hangar), Derek Roddy (Hate Eternal) and Gergo Borlai (Tribal Tech) as well as special guest John Tempesta (The Cult). Each show will offer a wrap-up of the day’s educational activities as well as discussions and performances by the all-star faculty. To celebrate the “Big Drum Bonanza”/Independence Day weekend, Drum Channel is also giving drummers a special, limited time opportunity to become members of the award-winning http://www.DrumChannel.com community. From July 1 through 7, unlimited access to hundreds of Drum Channel lessons and shows by drummers such as Thomas Lang, Gregg Bissonette, Terry Bozzio, Chad Smith, Stewart Copeland, Tony Royster, Jr., Peter Erskine, Dave Elitch, Luke Holland, Cobus Potgieter and many more is available for a full year at the reduced price of $49.90. The special “Big Drum Bonanza” deal not only provides 2 months of membership at no charge, it also includes a free $25 gift card good for downloads at Drum Channel’s online store. The gift card can be used independently or to augment Drum Channel’s online lessons with downloads of popular DVD content by Daniel Glass, Danny Seraphine, Buddy Rich, JR Robinson, Tony Royster, Jr. and Neil Peart, to name just a few. Drum Channel is a state-of-the-art provider of a wide variety of interactive drum education content, including http://www.drumchannel.com which features 100’s of lessons, lesson plans and live events as well as Drum Channel’s traditional DVDs and Digital Video Downloads (available at http://www.drumchannel.com/store). This entry was posted on Friday, June 27th, 2014 at 20:34	and posted in Drum Channel, Press Release. You can follow any responses to this entry through the RSS 2.0 feed. « Christian Vander’s Offering ‘Concert Triton 2013’ 2-CD/DVD Set Now Available!